New Pokemon game announced again.. But hey, at least it looks better! Tch, here we go again..
As we saw the silhouette past few months ago, and being revealed after: That’s Zoroark. 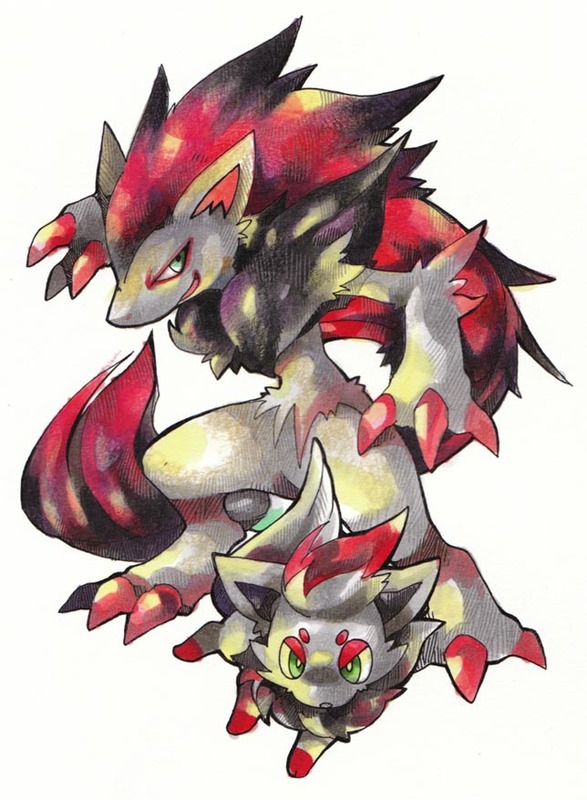 -Together with his pre-evo Zorua. Hm.. This two will be ta rivals of Riolu and Lucario, I think. And GOOD NEWS! Pokemon has done it! They’ve become awesome once again since their RBY/GSC/RSE/FRLG days! That’s such a glory .v. As far as I hear and see toward the Internet (<-My constant companion), The new games are called Pokemon “Black and White.” They said the names sounds so racist, but for me, no. Black and White here are being referred as those simple, yet very popular colors, and NOT referred to the races of people. It has an improved 3D graphics. Yeah, I saw them too. They look very awesome and attractive. It also has some cities which looks like a city. Not just a big space with small houses on it. I see some truck at one of the pre-release pictures. Oh, thank God, there are now vehicles in the Pokemon world. I think the Pokemon Center and the Mart will share the same building. The game will be on DS, and definitely NOT 3DS. And the official site with some few screencaps. Tags:Pokemon, pokemon black and white, Video Games! Someone changed her way here.. Okay. From now on, I’m not your average blogger anymore. I’m no longer that tweeny, cheesy, sugary-sweet, pop princess weeaboo kind of girl anymore. From now on, Mikaino is now knowned as Silver-Winged Fox MK. I’ll be more of a critic and such, just as my golden-hard, rock-solid mentor of mine. Goodbye to all of you.